Unlike most male cooks, I’m not obsessed with my gadgetalia. I’m perfectly satisfied with what God gave me: two rather nimble and photographic hands. [EDITOR’S NOTE: Oh, brother.] They’re good for all kinds of chopping, slicing, dicing, mincing, peeling, flipping, frying, turning, cranking, and vacuum-sealing. So you’ll find nary an extraneous widget in my arsenal—no Mickey Mouse pancake mold, motorized ice cream cone, pie bird, or ebelskiver turning thingamabob. My 10-digit portable tool drawer is more than enough. Then I met the Breakfast Sandwich Maker from Hamilton Beach. As I’ve confessed on several occasions, we frequent McDonald’s. A lot. Like several times a week. (Don’t judge me.) So much so that The One and I began calling it “Chez McDonald’s,” said with a French accent (SHAY meek-doh-NALDS) though after some years we shortened it to simply “Chez,” kind of like the Cher of the fast-food world. Our biggest indulgences are the breakfast sandwiches. Me: Sausage McMuffin with Egg. He: Egg McMuffin. Us: Sausage, Egg & Cheese McGriddle when there’s a 2 for $3 breakfast deal. 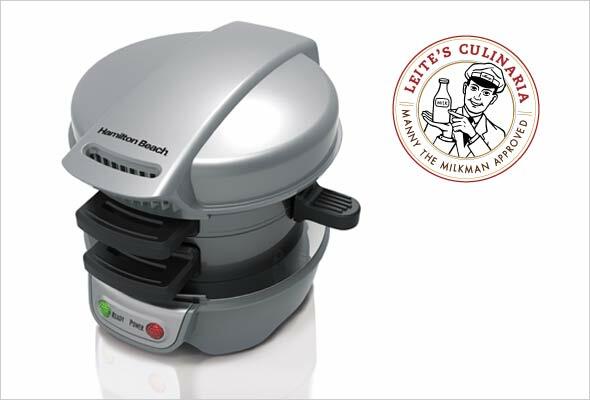 The Hamilton Beach Breakfast Sandwich Maker is two stacked chambers that cook both halves of your sandwich separately. In the lower chamber goes any bread you want for the foundation of your meal (English muffin, pancake, bagel) along with precooked meat (bacon, ham, sausage) or meat substitute (if you’re so inclined) and cheese. For the healthy among you, veggies also work. In the top chamber goes an egg, sunny-side up or lightly scrambled with a fork, and the top of your bread of choice. Close. Wait five minutes. Ta-da. Homemade Chez. Hot muffin, cheese warmed to just the right temperature to make its corners slump, and an egg cooked perfectly to my liking. I’ve gone so far as to use two eggs. It’s a bit crowded in there, and the egg sometimes oozes, but I find that for hungry-man appetites like mine, a single egg just ain’t enough. I aim for four minutes to get a runny egg that gently oozes onto the plate. I lightly rub the egg chamber with oil before use to help the cooked egg slip out. Even though it’s a nonstick surface, those egg proteins can sometimes stick. My only complaint is that this is a single sandwich maker. I want a double or quadruple maker, so that The One and I and any guests can face-plant into our sandwiches at the same time while the food’s still hot. Does this mean I’ll cave and order a banana slicer or radish-flower maker from QVC? Nah. Not when I’ve been endowed with such, um, gifts. The Hamilton Beach Breakfast Sandwich Maker is available most everywhere Hamilton Beach is sold—including Amazon; Bed, Bath & Beyond; JC Penny; Kmart; Target; and Walmart—for about $25.